I have a pretty big sweet tooth, and every once in a while I like to eat something fruity and sweet. A while ago I discovered Annie's little packets of fruit bunnies which, at 70 calories (1 weight watchers point) per portion-controlled 23 gram bag, are a perfect solution! 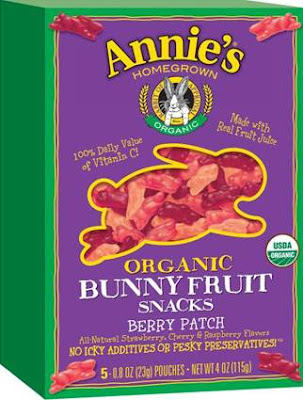 Annie's little bunnies taste a lot like gummy bears but, because they are flavored with real fruit juice, are actually quite a bit tastier and fruitier than real gummy bears. To quote the box, the Annie's bunny fruits have "no icky additives or pesky preservatives in them," and are all-natural and organic. They also have going for them that each packet has 100% daily value of Vitamin C! Each packet is also fat free. They come in a "Berry Patch" flavor -- with strawberry, cherry and raspberry bunnies and a "Tropical" flavor -- with mango-peach, tropical punch and orange flavored bunnies. They are both available at Whole Foods. I keep a few little bags of the bunnies in my desk at work. I don't eat them that often, but every once in a while I do get a sugar craving at about 4:00, and I find this hits the spot (vs. the other foods that are readily available). Those sound good! I love the Annie's bunny crackers. I've yet to see these, I'll have to keep an eye out for them! OMG - i have to find these. I love gummy stuff...and used to eat the welch's fruit snacks all the time. Yum. My kids love these too. My life just improved, hahah. I am going to have to pick these up whenever I spot them. They sound yummy!